3 March is Hina Matsuri, Japanese Girls’ Festival. 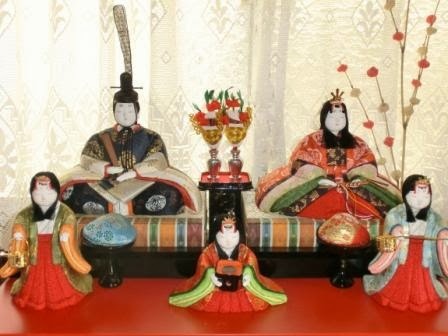 Families with girl(s) and some public places such as stations or town halls display Hina Dolls, Japanese traditional dolls, to pray and celebrate. 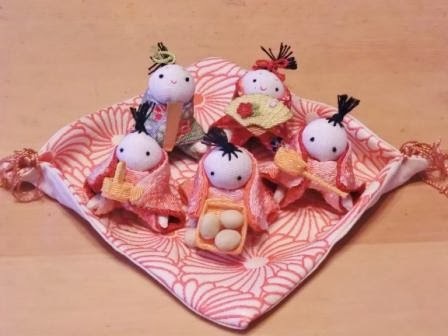 No one knows the EXACT origin of Hina-Matsuri, but one theory is that the oldest origin is noble girls in Kyoto in Heian Era (around 1000 years ago) playing with dolls. At that time, there was also a custom to float dolls to rivers to wash away bad luck to protect girls. In Yedo Era (from 1600 to middle of 19th century, one of samurais’s governments, which lasted the longest), these customs got combined and became a festival like today’s Hina Matsuri. Now it’s an event that is traditional but colorful. (I mean it is not boring!) People also eat some rice snacks (Hina Arare) and sushi for this festival. That’s what textbooks about Japanese culture say, so I hope to add one more story. Today’s children love fried chickens and fruit punch – it’s times! Souvenir Hina Dolls Advice for Travelers! When traveling in a foreign country, you want to explore the real culture like Hina Matsuri, don’t you? Although genuine dolls are too big and expensive as souvenirs, there are a lot of casual, pretty ones sold here and there! You’ll find them in souvenir shops and local shopping centers. If you are visiting Japan after Valentine’s Day, why don’t you take some hina dolls for your desk? 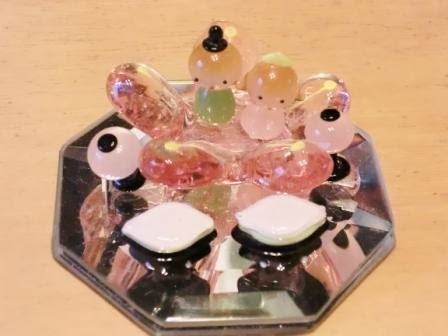 A glass dolls set. The flowers are peach blossoms (momo in Japanese) for Hina-Matsuri, not cheery (sakura) nor apricot (ume). I bought them years ago, but I think they cost around 1000 yen (around 10 dollars). I admit my taste is strongly reflected when I chose them from many dolls at some shops… There are also dolls of hanging type, wooden ones, etc. How can I tell which are Hina Dolls and which are normal Japanese dolls? The key is that Hina Dolls are always in a set. If you see a single Japanese doll, it is a normal Japanese doll which is for all the seasons. When you find a couple (and some others as I wrote) before Hina Matsuri, they are Hina dolls! When 3 March comes, Japanese people feel that spring is getting close. You read this, so you will, too! Want MORE about Japanese Early Spring? Hi, and thanks for visiting! I love pretty things so much. That's my taste.